Soldiers, military operations crew members provide collective defence measures to protect their country`s territory and other interests. They are employed by the Army. Train and exercise using various military equipment and tactics. Take part in military operations, e.g. capture or destroy enemy ground forces and repel enemy attacks. Monitor, operate, service and repair military equipment. Set up camouflage and other protective barriers, and dig trenches and bunkers for protection against attacks. Drive vehicles to transport troops, weapons and supplies. Parachute from troop transport aeroplanes while carrying weapons and supplies. Operate communications and signal equipment. Stand watch and guard military establishments and other buildings. 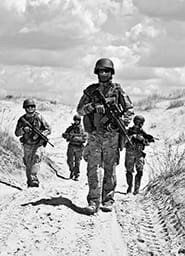 Patrol areas of possible military activity and carry out scouting missions to spot enemy movements and locations. Report to the commanders about performed operations and cases where the rules of military code were broken. Engage in peacekeeping operations and enforce ceasefire agreements. Provide aid in emergency situations, such as civil disorder, natural disasters and major accidents.